THE FRENCH COOK: Soups and Stews, Holly Herrick - Joelle Delbourgo Associates, Inc.
Holly Herrick loves France and French cooking. 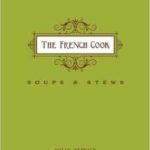 And in this cookbook (her third in The French Cook series), THE FRENCH COOK: Soups and Stews (Gibbs Smith, September 2014), she jumps into bowl after bowl of glorious French soups with inspired abandon and a generous dose of classical technique. Le Cordon Bleu trained chef and former resident of France focuses on the nuances and techniques for expertly layered flavors. Beginning with stocks, she continues with cold soups, classic soups and stews, creamy soups, and consommes in ensuing chapters, each one as delicious as the next. Similar to sauces (Herrick also penned The French Cook: Sauces), soups are the ideal conduit for creating maximum texture and flavor. Only, with soups and stews, the cooking canvas is much broader and there is a precise yet playful emphasis on presentation and garnishes. Whether a sumptuous French Onion Soup topped with croutons and bubbling Gruyere, or a riff on a classic sauce in the creamy, velvety Soup Soubise topped with fried shallots, all you need to know about making perfect French soups is neatly tucked between 128 beautiful pages.